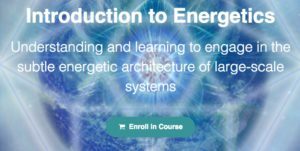 I have just completed a new online course aiming to give people an introduction to understanding and working with energetics in large-scale systems. You can either take it on your own self-paced (“Lite”) or together with others and myself with discussion and feedback (“Immersive”). Check it out! This entry was posted in Resources and tagged ecointention, energetics, volution theory by Peter. Bookmark the permalink.